Classic Mac collectors are a creative bunch. Where others see digital trash, we see potential. 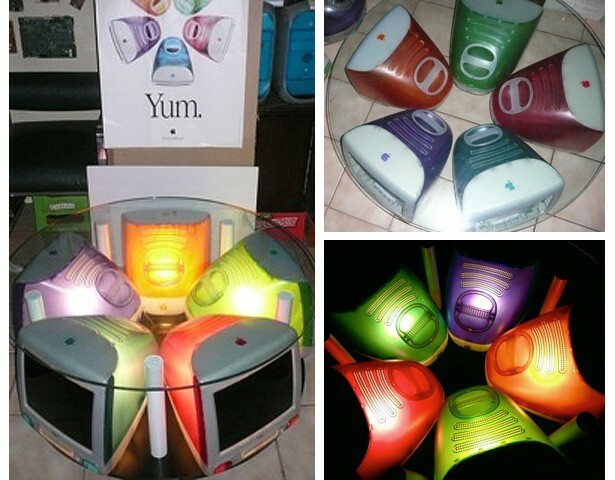 Steve Abbott, curator of MacAbbott’s Mac Museum in Charlotte NC, has just created an innovative coffee table using those five-flavored candy-colored original iMacs in the style of Apple’s iconic Yum advertisement. Steve stripped the guts out of five systems – blueberry, grape, tangerine, lime, and strawberry – added opaque white paper and light fixtures inside, then fashioned a table around them with a glass top and birch base. Reminds me of the kids tables inside Apple retail stores, with the retro glow of high tech lifesavers. The Yum coffee table is one-of-a-kind and for sale, bids start at $5,000; contact MacAbbott for details.